On a day when Golf.com claimed the Dustin Johnson was not on leave of absence but suspended by the PGA Tour for failing a drugs test for cocaine — the Tour later denied in a statement they had suspended the American — Sergio Garcia came home in 27 for a 61 to lead the WGC-Bridgestone Invitational with Rory Mcllroy struggling to keep pace despite a sizzling 64. As if all that wasn't enough, Mark Murphy went out in 28 on the PGA Europro Tour at Mount Wolseley where Mick McGeady finished runner-up. First to Firestone Country Club in Akron, where the day was lit up by Golf.com's story in the wake of Dustin Johnson's claim that he was taking leave of absence from the game and missing Firestone, the US PGA next week and the Ryder Cup to "seek professional help." According to Golf.com's Michael Bamberger and Mike Walker, who cite an unnamed source, Johnson has been suspended due to a failed drug test that involved cocaine, adding that it is the third time that Johnson has failed such a test, and that he is being suspended for six months. ESPN.com's Bob Harig takes the Tour to task over its policy of not commenting publicly on suspensions or fines — except in the case of a suspension for the use of performance enhancing drugs — and the apparent contraction of today's "he's not suspended" statement. Absurd. The PGA Tour has long been chastised for its lack of transparency in these matters, and while a fine for cussing might not be worth telling the world about, a failed drug test that results in a player being sent to the sideline for any length of time and kept from competing is absolutely information that should be disclosed. As for the tournament, a relaxed Sergio Garcia single-putted the last 11 holes and finished with seven straight birdies for a career best 61 — nine under par — to equal Tiger Woods' course record and take a three shot lead on 11 under 129 from Justin Rose, who had a 67. 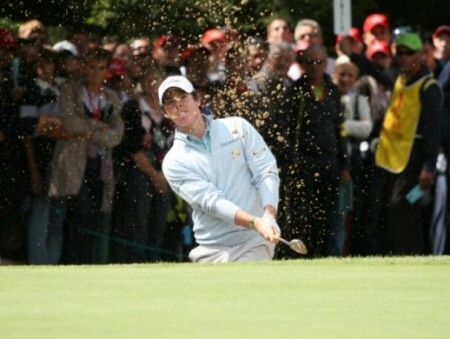 Open champion McIlroy was in the group behind and felt he had to finish strongly. He birdied his last two holes for a 64 and joined Marc Leishman of Australia (67) four shots off the lead. It was a day to forget for Graeme McDowell, however, as he shot a level par 70 to slip one place to tied 35th on one over par. PGA Europro Tour — Mick McGeady closed with a six under 66 to finish second (£5,000), two shots behind England's Stuart Archibald in the Walk In My Shoes Open at Mount Wolseley Hotel, Spa & Country Club in Co. Carlow. Archibald carded a final round 69 to finish on 14 under par and win £10,000. However, following a bet with former European and PGA Tour player turned TV pundit John E. Morgan, the 30 year old must now also dye his beard blue. Banbridge's Richard Kilpatrick was fourth, six behind the winner on eight under after a closing 72. But the real fireworks came from Waterville's Mark Murphy, who burst into contention with eight birdies on the front nine of eight under 28. However, a double at the tenth and a bogey at 11 saw him slip back and he signed for a final-round 66 (-6) with a birdie at 14 to finish the tournament tied fir sixth with four others. Challenge Tour — A back nine of 30 which included two eagles propelled Ben Evans to the top of the leaderboard on the second day of the inaugural Azerbaijan Golf Challenge Open. The Englishman opened with a three-putt bogey and was one over par after nine holes, but picked up six shots on his way home to sign for a round of 67 and enter the weekend on 11 under par, one shot ahead of Benjamin Hebert, who posted a stunning 62. Ruaidhri McGee (70) is tied 40th on wo under with Gareth Shaw (71) just making the one under par cut. Rathmore's Alan Dunbar (75) for four over and Mourne's Reeve Whitson, playing in his second event as a professional, missed the cut. Whitson made two early bodies but double bogeyed his fifth hole of the day and ended up adding a 75 to his opening 76 to miss the cut comfortably. PGA Irish Region — Damian Mooney carded back to back rounds of 67 to successfully defend the Cairndhu Pro-Am title. Giles and McNamara had led overnight after opening rounds of 65 (-5) but struggled on day two at the Co Antrim course, ending the day with a pair of three over 73s. McNamara at least had the satisfaction of leading his amateur partners of Scott, Blair and McAllister to the team title with a two round total of 186. Mooney actually made a sluggish start to his round yesterday, dropping a shot at his opening hole, the par four 10th before adding eight successive pars to go to the turn in one over 37. After another par at the par four first, he played the remaining eight holes in four under with birdies at the second, third, fourth, seventh and ninth, offset by a dropped shot at the eighth. Rory McIlroy came out after a three-hour weather delay and birdied his final two holes to cut Sergio Garcia's five shot lead to just three heading into the final round of the WGC-Bridgestone Invitational in Akron. Headfort's Rory McNamara is just four shots off the pace entering today's final round of the CEEVEE Leather Open on the EDP Tour at Walldürn-Neusaß near Frankfurt. Rory McIlroy and Graeme McDowell are hoping to bounce back in the final round of the WGC-Bridgestone Invitational and head to next week’s US PGA on a massive high. Former champion David Mortimer will be bidding to continue his almost faultless bid for his second Ladbrokes.com Irish PGA title when he takes a one stroke lead over the European Tour star Damien McGrane and Belfast’s Damian Mooney into the final round at Seapoint.